The Pima School Food Service Department is committed to serving high quality, nutritious meals to our students and staff. We also teach the importance of nutritious meals, and we encourage good eating habits. 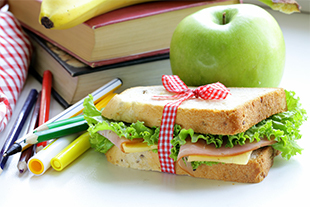 Children who eat school breakfast are likely to have fewer absences and incidents of tardiness than those who do not. By eating breakfast, students get more of important nutrients, vitamins, and minerals such as calcium, dietary fiber, folate, and protein. Schools that provide breakfast in the classroom to all students have shown decreases in tardiness and suspensions as well as improved student behavior and attentiveness. What you eat for breakfast can have an impact on learning. One study showed that eating breakfast food high in fiber and low in sugar helped students sustain the cognitive effects of breakfast. School breakfast provides ¼ the recommended amounts of protein, calcium, iron, vitamin A, and vitamin C for the day. For more information, feel free to contact our food service director, Kenia Cano, by email or by phone at (928) 387.8007. We need your input about our food services program. Please take a few moments to complete our parent/student survey.